When you have been seriously injured in an electrical accident on a construction site, you need to make certain that someone is aggressively pursuing your right to receive compensation for medical care, pain and suffering, and lost wages. If you have lost a loved one due to electrocution, you need a lawyer who can help your family receive the compensation it deserves from all available sources. Queens electrical accident attorneys of The Orlow Firm can provide the caring and diligent representation you and your family need following a construction site accident. Call (646) 647-3398 or contact us online to schedule a free consultation. We are prepared to represent electricians, wirers and a broad range of other construction workers injured by electricity. 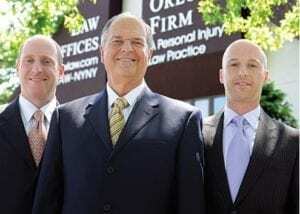 As accomplished personal injury lawyers, we are recognized for our skill in handling third-party claims. Third party-claims can be filed against owners, contractors, subcontractors and other negligent parties that are not your employer or a co-worker. Our lawyers do not handle workers’ compensation claims, but can refer you to a qualified workers’ compensation lawyer to handle that aspect of your claim. Since 1981, we have successfully recovered many millions of dollars in compensation on behalf of construction workers injured in accidents. For more information regarding our firm and your rights under the law, contact Queens electrical accident attorneys at The Orlow Firm. We offer free initial consultations and operate four offices across New York City for your convenience. We can go to you if you cannot come to us.